So dedicate a block of time to set simple goals, put away your electronic devices and enjoy! First, decide what habitat most closely matches your own: grasslands, deserts, tundra, woodlands, mountains, ponds, streams, marshlands, coastal wetlands, shore. 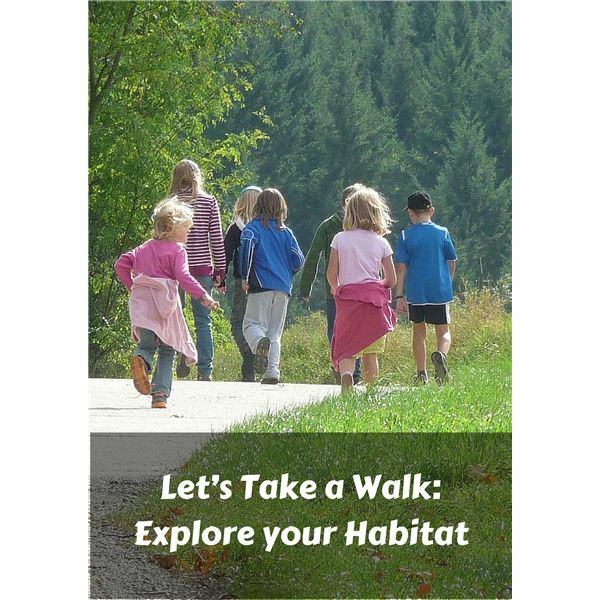 When you have decided what habitat most closely matches your own you may want to use the Internet or local library to find out more about your area. Then plan what you are going to look for while you are on the walk (animals, plants, etc.). Then start walking! Encourage your child to be a detective. Look up into the trees and on the sidewalk to watch the ants scurrying around. Describe the plants and trees that you saw. Does your habitat have all the elements necessary: water, oxygen, soil or sand and rocks? What do you think happens to the animals and plants when the seasons change in your habitat? Since my family lives in the desert southwest, our seasons do not change drastically so our answer to this question will be different from some others. Was there something that surprised you on the walk? My daughter and I found seven birds’ nests in a tree next to our driveway! We had never noticed them before. What was your favorite thing to see? Would you like to learn more about it? Now it is time to do some artwork to represent your adventure. You may choose to use crayons, markers, colored pencils, paint and/or construction paper. Each time you take a walk you will note changes and find news things. Habitats are not stagnant. A tree may fall and something else takes its place. What happens to the animals that made the tree their home? Every walk you take can be a learning experience and provide lovely memories.